The new Real Betis 18-19 away kit was presented and launched earlier today by the Spanish club. Just like the new Betis Sevilla home jersey, which dropped in early July, the away is made by new supplier Kappa, which replaced Adidas before the new campaign. 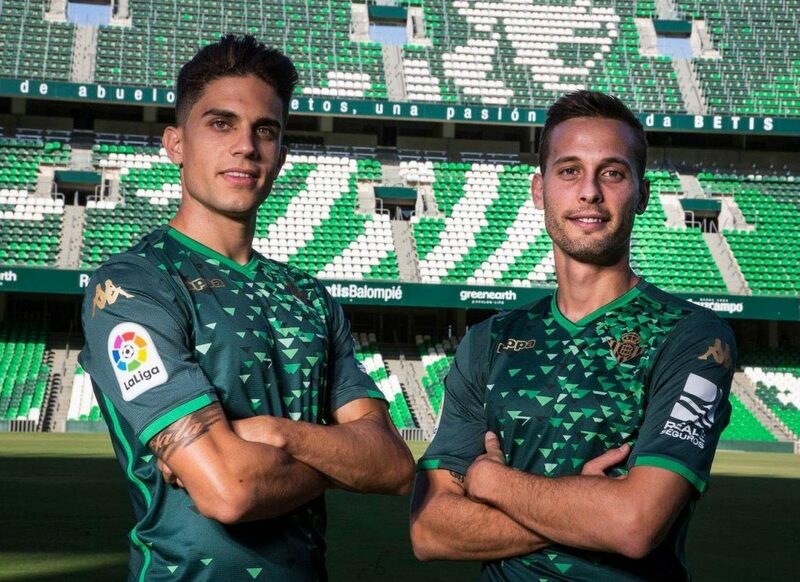 Predominantly dark green, the Betis 2018-19 away jersey boasts an interesting graphic that centers around the crest. It’s a gradient of sorts which consists of small triangle shapes in different shades of green, probably inspired by the shape of the club logo. This logo, just like the Kappa writing on the right chest of the new Betis 18-19 away shirt and the Kappa logo on the arms, is gold. A simple crew-neck collar of the same color as the shirt and brighter green sleeve cuffs round off the bespoke look. Green shorts and socks with gold logos complete the Betis Sevilla away kit by Kappa.